Or I’ll overthrow the city in forty days. And God got angry with Jonah down there. And laid poor Jonah on a bed of sand. Repent, repent you wicked men. The whole story should be read in the book of Jonah, which will only take a few minutes, for it is only four chapters long. It is a very dramatic story and you will enjoy it, but the following is a brief account, along with some additional insight. Although written in the third person, most scholars believe the book of Jonah was actually written by Jonah, himself. It took place during the reign of Jeroboam, so that puts the date between 793–753 BC. The ancient city of Nineveh was located on the east bank of the Tigris River (near Mosul, in modern-day Iraq) and was protected by inner and outer walls, like Babylon. 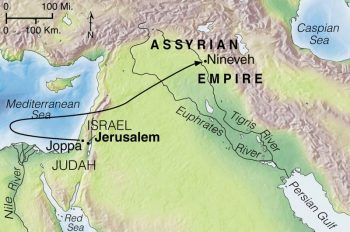 Being about three miles (5 km) in diameter, Nineveh was a colossal size in the ancient Near East.3 It was built by Nimrod, circa 3000 BC. Jonah was an educated man, as one can tell by reading this book, so why would he purposely disobey God? He understood that Nineveh was evil, but he figured that was their fault, not his, and they deserved what consequences that brought. He didn’t want to be bothered and was a lot like many people today, he had a “why me” attitude. God gets a bit ticked-off, for a mighty windstorm came upon the sea that threatened to break up the ship. The mariners freak-out and prayed to their gods and begin throwing stuff overboard to lighten the load, but what does Jonah do — he calmly goes below deck and takes a nap. The captain goes down to Jonah and says, “What are you doing sound asleep? Get up, call on your god! 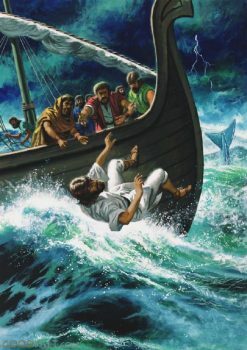 Perhaps the god will spare us a thought so that we do not perish.” (Jonah 1:6) Jonah is not willing to do this, so the sailors decide to cast lots to find out which person on board is responsible for this calamity. Casting lots was a method used, at that time, to determine an outcome or make a decision. The lot was a collection of small stones or sticks that were marked with symbols and were read after being thrown. This method produced an impartial and unbiased decision, thereby eliminating human influences, like politics or favoritism. Although used by ancient Hebrews for letting God make the decision, it was also used by believers of other religions to let their own gods decide an outcome. A modern analogy would be flipping a coin or throwing dice to make a decision. 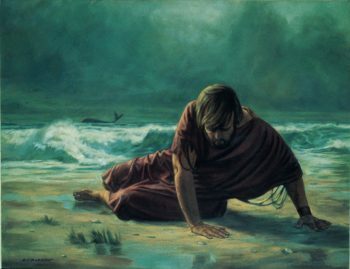 At this point, Jonah would rather die than do what was commanded by God, so he suggests that they throw him overboard to save themselves. After the storm becomes more violent and after continued praying by the sailors, they did so and as soon as Jonah hit the water, the sea ceased its fury. For one thing, this event converted the mariners, for they were now giving thanks to the Hebrew’s God, instead of their own, for ending their terrible situation. As for Jonah, he was swallowed alive by — what? Was it a Whale, a Fish, or Something Else? Now sackcloth was a material made from goat hair and usually worn over the shoulders or as a loincloth. It was used variably as a symbol of mourning, danger, grief, or distress.10 When the King also sat in ashes, he showed humiliation and repentance. He probably cast them in the air “toward heaven” and let them fall on his person. In extreme cases, the person sat upon a heap of the ashes,11 which he did. And prayed they did, all of them, as well as fast — the citizens and the animals. 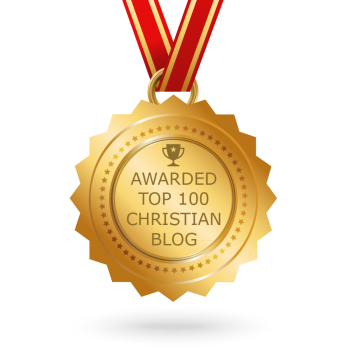 The hot rising sun, along with a sultry wind, bore down on Jonah so much he felt faint. Now he was angry again. 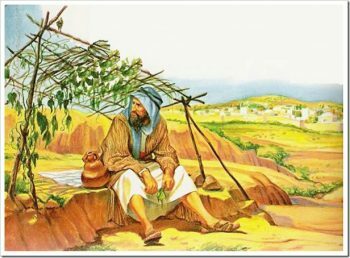 First he was discomforted by being thrown overboard into the sea, then again with walking through Nineveh shouting a warning, and again with the city’s repentance, and now by the loss of the shade from the plant. So demoralized and depressed was he that he wanted to die.14 I’m sure that he figured he was being discomforted in all kinds of ways for someone else’s problems; why must he suffer while the evil doers were not disciplined? The book of Jonah ends abruptly with only a question from God. If Jonah answered this question, we will never know. Maybe it is just rhetorical and that is the point, for it gives us something to think about. Did Jonah finally learn a lasting lesson? I don’t know, but if he didn’t, at least we can learn from his failings. A call from God can come in many forms and variations, but if he calls, it is important to answer. If we don’t answer the call, we may not be jeopardizing just our own circumstances, but those of others as well. And if we disobey God’s call, well . . . we will likely pay a price. Knowles, Andrew, The Bible Guide, 1st Augsburg books ed. (Minneapolis, MN: Augsburg, 2001), p. 370. Elwell, Walter A., (ed. ), Baker Encyclopedia of the Bible, (Grand Rapids, MI: Baker Book House, 1988), vol. 1, p. 1463. Schrader, Stephen R., “Jonah,” in Evangelical Commentary on the Bible, Baker Reference Library (Grand Rapids, MI: Baker Book House, 1995), vol. 3, p. 645. Dockery, David S., ed., Holman Bible Handbook, (Nashville, TN: Holman Bible Publishers, 1992), pp. 478–480. Schrader, Stephen R., “Jonah,” in Evangelical Commentary on the Bible, vol. 3, Baker Reference Library (Grand Rapids, MI: Baker Book House, 1995), p. 647. Elwell, Walter A., (ed. ), Baker Encyclopedia of the Bible, (Grand Rapids, MI: Baker Book House, 1988), vol. 2, p. 1880. Hastings, James, (ed. ), A Dictionary of the Bible, Dealing With Its Language, Literature, and Contents, (Edinburgh: Charles Scribener’s Sons, 1911-1912), vol. 1, p. 165. Hannah, John D., “Jonah,” in The Bible Knowledge Commentary: An Exposition of the Scriptures, ed. Walvoord and Zuck, (Wheaton, IL: Victor Books, 1985), vol. 1, p. 1470. Thank you for your visit and for taking the time to comment. I’m glad you liked the article. 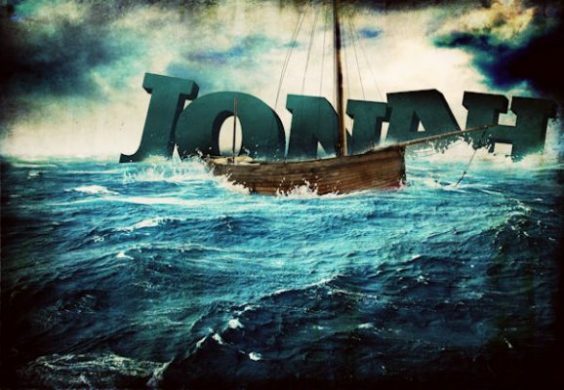 This is more than I ever knew about Jonah. His attitude gave me the impression he was depressed. Thank you for the comment. I believe your assumption is correct. Thanks for a great article. I learned a lot. 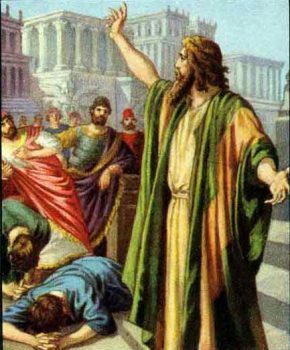 When I was young and went to Sunday school, all I learned about the Jonah story was that if I don’t obey God’s laws, he was going to punish me so I better be good. What a thing to teach. Thanks for the video link too. Thank you for the nice comment and for sharing a bit about your youth. My own youthful participation in Sunday school for children wasn’t all that great either; it was more of a child care environment than a teaching experience. I always thought knowledgeable members should teach the children, not just grab a volunteer to act as a baby sitter. I’m glad you gained a bit more knowledge about Jonah and his journey. Every now and then, I try to slip something interesting into the References & Notes, so I’m happy you spotted the video.